Easy Low FODMAP Salad, with Roasted Aubergine and Courgette. Perfect salad with a rich Mediterranean taste for those lazy days when you crave something filling and refreshing. Growing up, I always avoided eating salads, mostly because I was always used to having the very basic boring green salad. 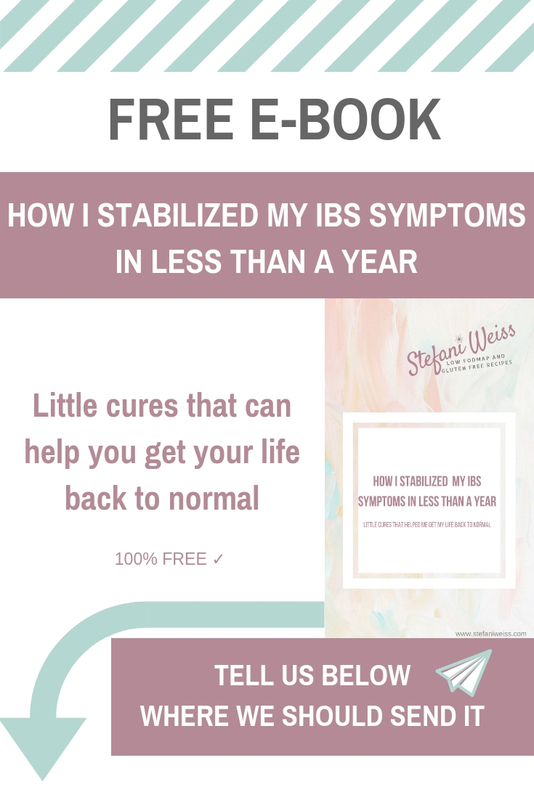 When I got diagnosed with IBS and food intolerances, I started changing my diet to eating healthier and more wholesome meals. And then I realized how many varieties of salads there are and how incredibly delicious they taste. In fact, salads are the one dish that offers the opportunity to experiment with so many different flavors, from adding different ingredients to combining a variety of dressings. Salads make every meal richer and more delicious, but also great on its own, depends on the ingredients they can make a great light lunch or dinner. However, I must admit that I there are days that I’m either very busy (or just lazy 🙂 ) to make anything additional to my main meal. This Easy Low FODMAP Salad, with Roasted Aubergine and Courgette, is perfect for those days. It ‘s very simple to make, and you can keep it in the fridge for up to 5 days. I usually make it on Sunday and have a ready to eat salad for the entire week. This salad has a very diverse texture and flavor, from the soft, melt-in-your-mount aubergines and courgettes, to the juicy raw cherry tomatoes and crunchy nutty walnuts. All the ingredients go incredibly well together. However, the dressing takes this salad to a completely another level. Easy Low FODMAP Salad, with Roasted Aubergine and Courgette. Perfect vegan-friendly refreshing salad with a rich Mediterranean taste. 3. Use pure maple syrup (low FODMAP) not maple flavored syrup (as that one could be high FODMAP).